There’s a growing trend at the moment for smartphones with full HD displays and now Pantech is about to join the fray with its new flagship phone for release early next year, the Pantech Vega IM-A860. It’s set to rival the likes of the HTC Droid DNA that recently released on Verizon, aka the HTC Butterfly for other regions, and there are others such as the Oppo Find 5, also with full HD. Read on as we have some early details for you. The first smartphone to feature a full HD 1080p display was the HTC Droid DNA and this is proving extremely popular with widespread praise for its gorgeous 441ppi display. We’re looking forward to seeing what the other major manufacturers come up with in response and Pantech is already in on the action with the Vega IM-A860. This is likely to be a codename so look out for a name change at some point. As you can imagine there’s not a lot of information available yet as the phone has only just been leaked by way of Wi-Fi certification. 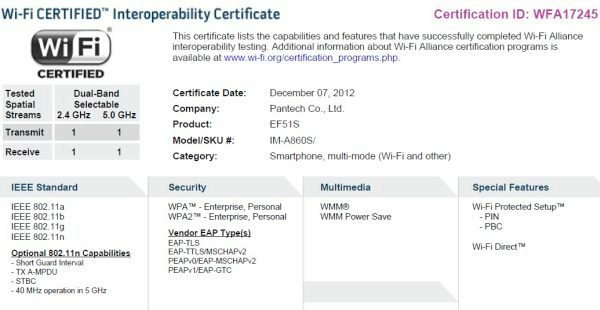 The specs of the Pantech Vega IM-A860 are rumored to include the ubiquitous 1.5GHz Snapdragon S4 Pro quad-core processor that seems to be in many of the latest handsets and an HD display with resolution of 1920 x 1080. The display size is not yet known though it’s possible it could be a 5-inch display as on the HTC Droid DNA. Other specs are said to be Adreno 320 graphics and LTE connectivity and it will probably run on Android 4.1.1. Jelly Bean. There’s no mention just yet of further details such as RAM, internal storage, battery and camera set-up but if Pantech is going to the trouble of a full HD display it’s more than likely that other specs will be top-notch too. Android Authority suggests the Pantech Vega IM-A860 is heading to two Korean carriers, SK Telecom and LG U+ and the real contest will come if it also releases outside Korea, especially as Pantech is likely to keep the price as competitive as possible. We’d like to hear your thoughts on this upcoming Pantech smartphone with full HD display and quad-core processor. Is this something that you’d like to hear more of? Are you hoping it may release in your region? Let us know with your comments.